This section includes specialist facilities that can accommodate brain injured people to manage their rehabilitation and care. Residential and supported living settings across England and Wales. Award winning neurological rehab specialist with six UK locations : York, Lincoln, Birmingham, Northampton, Bedford, Oxford. Cygnet Health Care provides clinically led evidence based neuropsychiatric pathways for individuals with behaviours that challenge following an Acquired Brain Injury. Our specialist environments engage service users - offering opportunities to minimise challenging behaviour whilst maximising independence. Provided in small hospital settings near Nottingham at Cygnet Grange and Cygnet Lodge; in Birmingham from Cygnet Heathers; in Bristol at Cygnet Brunel; in Darlington at Cygnet St William’s. Our residential service in Birmingham (Meadows Mews) offers 10 beds outside a hospital setting to allow service users to complete neurorehabilitation in the community. Specialist Residential Services for Acquired Brain injury; Catastrophic brain injury; Neurological disorders & Transitional Care; Delivered with a person centred supported living approach. We can provide access to a network of Occupational Therapy; Physiotherapy and Neurological counselling if required. Details on request. We work closely with number of MDT of professionals to ensure the best care for those we support. Purpose-built care homes incorporating features appropriate to neurological conditions in Milton Keynes and Peterborough. QEF is a national charity committed to providing life-transforming services that enable people with disabilities to increase their independence and achieve their goals in life. Based in Surrey but accepts referrals nationwide. Providing expert care for people with brain injuries, mental illnesses and learning disabilities. Facilities around the UK. The Marbrook Centre is a bespoke Neuro Rehabilitation service on the Cambridgeshire and Bedfordshire boarders (PE19 8EP), which opened in May 2016 (Nationwide referrals welcomed). Care package tailored to individuals with acquired brain injury or a combination of complex needs. Five homes located around Northampton. Residential care for young physically disabled adults with complex disabilities following traumatic or acquired brain injury, spinal injury or degenerative disease. Residential and supported living services in Herefordshire. Residential service in a variety of small group and individuals settings. Hospital & Rehabilitation Centre with day services & outpatient opportunities. Residential and supported living services in Leominster, Herefordshire. Three residential facilities around Hinckley offering tailor made packages to achieve the best outcome for adults with acquired brain injury. Long term and respite care for people with brain injury, learning disability and mental illness. Residential, respite and transitional care for individuals with acquired brain injury or a combination of complex needs. Purpose built facility to provide tailored, individual rehabilitation programmes for adults with an acquired brain injury or neuro-disability. High View Care Services offers year-round residential rehabilitation and support services for men and women aged between 18 and 65 years from diverse backgrounds. Purpose built unit for adults with ABI. 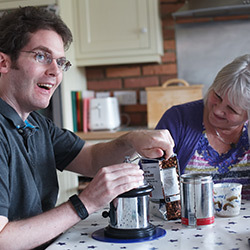 Providing care, support and accommodation for people with an acquired brain injury. Specialist residential services for acquired brain injury, catastophic brain injury, neurological disorders and transitional care. Delivered with a person centred supported living approach. We can provide access to a network of occupational therapy, physiotherapy and neurological counselling if required. Details on request. We work closely with a number of multi disciplinary teams of professionals to ensure the best care for those we support. Specialist nursing care for adults with complex needs and disabilities.